What do you do when it is 108 degrees out and the weather forecast is predicting 120 degrees in just a few days time? You practice making sweet sun tea. Cody and Carter researched sun tea and found a recipe they wanted to try. It was simple enough and would have gone swimmingly had the new sun tea container spigot not leaked causing me to madly pour our newly made tea into several random glass containers. I spilled a good portion of it on the pool deck, inadvertently feeding the same ants Husband has been trying to kill all summer. Ooops, sorry about that. 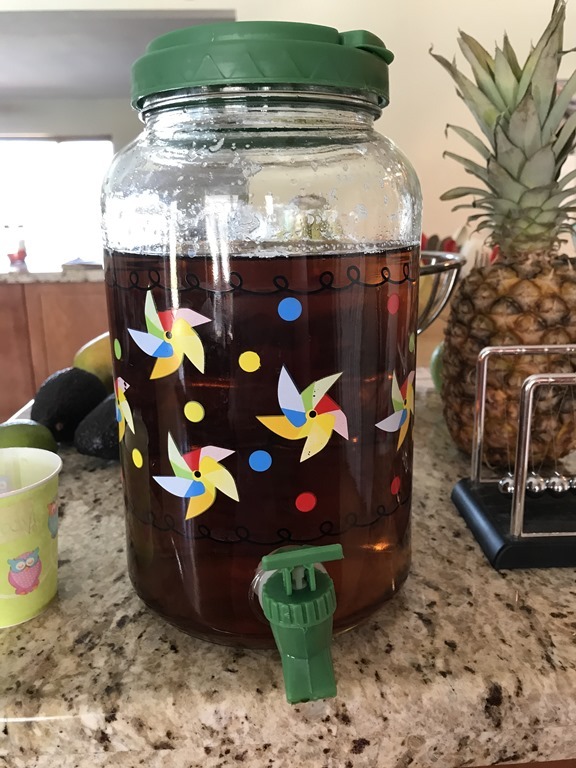 Once Husband tightened the spigot and our tea had steeped in the backyard, we poured it back into the cute sun tea container and were ready to give it a try. Cody insisted we drink the tea in small Dixie cups so we labeled our cups for reuse and each had some tea. Carter hated it, but had informed me earlier that he did not like any sun tea (this, regardless of the fact that he had never had sun tea before), so his reaction was no surprise. Cody loved it and Husband and I thought it was pretty good (a bit too sweet , but not bad). Husband went back down the hall to his in-home office and the boys and I entertained ourselves with making sock puppets. At some point, Cody decided to see if Husband wanted another 5 oz cup of sun tea so he when off down the hall to ask him. Cody came back into the kitchen asking, “where’s the tequila?” under his breath several times. I was shocked. Why was Cody looking for the tequila? Husband would never drink while working nor would he ever ask one of our boys to pour him a shot. I was trying to process what was happening and thinking of what to say, when Cody located the tequila bottle on our kitchen counter (no judging – it is summer and hot and margaritas make for a nice pre-dinner drink). He let out an exclamation of joy and reached toward the bottle. Sitting next to the bottle was Husband’s sun tea Dixie cup. Husband had told Cody that he would love another cup of sun tea, and had told him where he could find his cup. Apparently my mind does not jump to the simplest nor the most innocent of answers. This entry was posted in Little Feet, Random Thoughts and tagged Children, Humor, Kids, Summer, Sun Tea, The things that kids say. Bookmark the permalink. Ha! Close call there. 🙂 Makes me wonder if tequila would taste good with the tea, but probably not. Hahaha, see we have tendency complicate everything !